A retaining wall can help you create a terrace or a flat area in a steep yard, or it can simply hold up a sloped bank to prevent soil erosion. Keep it simple and you can even build it yourself. 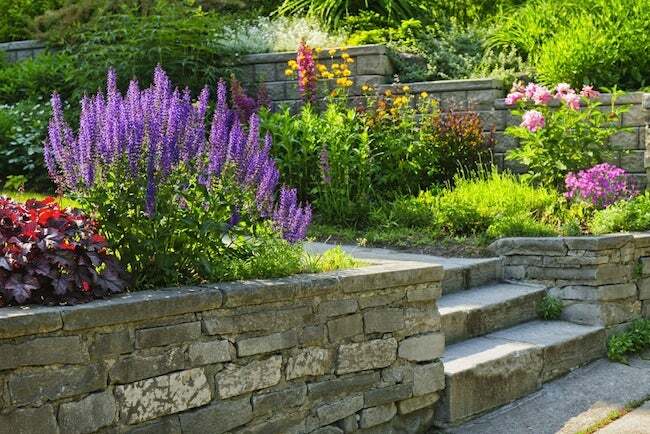 Retaining walls offer aesthetic as well as practical benefits: In addition to beautifying the home, they inhibit soil erosion and provide privacy to outdoor living areas. Retaining walls even boost home value, rewarding homeowners with a favorable return on investment more often than not. 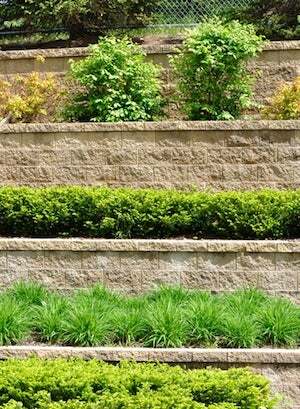 If you are planning to build a retaining wall, you may choose from a wide range of materials. Which material is best for your wall depends on a few variables: your personal style sense, the project budget, and the nuances of the site in question. Homeowners who are building a retaining wall often use one of the following materials. • Interlocking concrete blocks. Available in many shapes, textures, and colors, interlocking concrete blocks are mortar-free, cost-efficient, and highly durable, offering both fire and water resistance. • Railroad ties. An inexpensive option, railroad ties have a significant downside: they are clunky to work with, requiring a labor-intensive degree of sawing and drilling. • Natural stone. This is the most expensive of all—at least initially. Over its very long life span, however, a natural stone retaining wall needs little maintenance. • Brick. Very durable, brick delivers a refined look, but at a price—the cost of materials is higher than for most other options, and for best results, it’s recommended to hire a professional. • Cinder block. The primary selling point of cinder block is its low price. Although it’s not very attractive on its own, cinder block can be painted or surfaced in stucco. • Concrete. Unadorned concrete can look pretty utilitarian, but it can be beautified with paint or even stone veneer. While retaining walls of this type are relatively inexpensive, they can be difficult to repair or remove. For the average do-it-yourselfer, building a retaining wall is easiest when using masonry blocks that will be stacked no taller than three feet, with no mortar binding the stones or concrete members. Certainly, experienced amateurs are capable of completing more complex masonry installations or of building retaining walls using other materials, but novices with such ambitious goals are encouraged to work with an experienced landscape design contractor. Start by marking out the site where you intend to build the retaining wall. For this task, use wood stakes and a mason’s line. (For a curved wall, mark instead with a garden hose or spray paint.) Remove all loose debris and plant material, including grass, from the designated area. With a shovel, dig a trench to accommodate the bottom of your first masonry row. The trench must go down one inch for every eight inches of planned wall height. So if you are building a retaining wall that is three feet tall, then four and a half inches of the initial masonry course should sit below grade. Line the back and bottom of the trench with landscape fabric, then set a perforated drain pipe along its length. Add four inches of gravel, leveled and tamped down, followed by one inch of bedding sand. Stagger succeeding courses of masonry so that the wall leans slightly toward the hill against which you are installing the wall. By building the wall on a backwards slant, you counteract the effect of gravity. Further stabilize the wall by planting flowers and small plants along its top. The roots help hold the soil together, and the vegetation offers the peripheral benefit of blending the retaining wall with its surroundings. Avoid planting trees and bushes close to the masonry, as their migrating roots can easily weaken the wall you worked so hard to erect.